When we last saw Scarlett O’Hara Butler, Rhett said he didn’t give a damn about what happened to her. Gone with the Wind is a classic story beckoned for more from the characters. Alexandra Ripley gave us more in her best-selling sequel, and that turned into a TV mini-series. 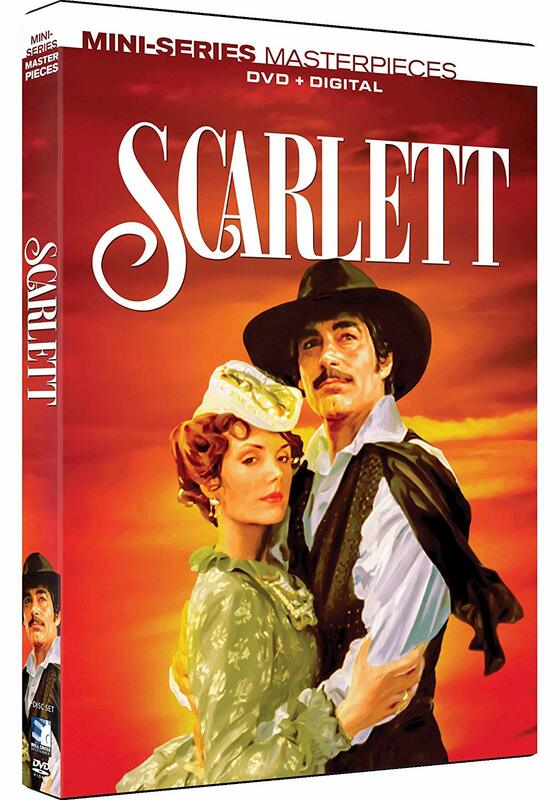 Scarlett is now available on DVD + Digital for all the fans who long to see what happened next for Scarlett, Rhett, and of course, Ashley. With their separation, Scarlett is set on getting back her husband, but he won’t hear of it. They share one last passionate encounter that results in pregnancy. Aha, Scarlett thinks. This is how I will win back Rhett’s love. But it doesn’t quite turn out the way she plans. Before she gets a chance to tell him about the baby, Rhett legally divorces her. Now pregnant and not wanting to trap Rhett by telling him about the baby, Scarlett heads off to Ireland, the homeland of her family. She locates her relatives and becomes an honorable member of the town. Not wanting to disclose she is a divorced woman, Scarlett tells everyone her husband is dead. Now, as a widow, she gets more compassion as she sets out to return her ancestral home of Ballyhara to its rightful glory. Meanwhile, Rhett remarries and Scarlett continues her lovely life in Ireland, getting caught up in the political turmoil between the Irish and the English. Nevertheless, she is a beloved member of the community and creates a happy life for herself and her daughter. Back in Georgia all the wounds of the past between Scarlett and her sister are healed. And she now realizes her affection for Ashley was just that. Her one true love is and will always be Rhett Butler. Unfortunately, Scarlett gets involved with a violent man and ultimately finds herself on trial for her life in England. To say this is engrossing is an understatement. Viewers might not want to stop watching during the 364 minutes of this mini-series. It’s the perfect way to spend a snowy day or a rainy night, or just a great weekend. It keeps viewers’ attentions from the start to the end. While it is a difficult task to take on a role that is so embedded in our minds and hearts like Clark Gabel’s Rhett and Vivian Leigh’s Scarlett, in 1994 Joanne Whalley-Kilmer stepped wonderfully into Scarlett’s shoes and Timothy Dalton took on the persona of Rhett. It might take a few minutes to adjust your mind to these new actors, but after you do the movie rolls by with heart, love, and compassion. The war is over but there is much more to this story. And after viewing this movie, it is apparent that Rhett Butler was lying when he said he didn’t give a damn. Scarlett is now available on DVD.